If you want to secure your Galaxy smartphone, the first thing that you should do is set up a screen lock. But what if you want to go a bit further, and protect specific things on the device? Well, Samsung just released Secure Folder, which gives you a "private, encrypted space" to store sensitive data in. Secure Folder is derived from Knox, the company's secure platform for business users, and can be seen as a consumer-focused iteration. It acts as a sandbox for apps and data and works with existing authentication options to keep them safe. "Users may leverage this feature to store and encrypt personal and private content, such as apps, images and documents, and keep them hidden. They can also make copies of their favorite apps and easily access them via alternate profiles. Any notes, photos, contacts or browsing history within the apps stored in Secure Folder will remain separate from the same apps outside Secure Folder", explains Samsung. To secure and unlock the data in Secure Folder, you can use a PIN, password, pattern or a fingerprint. The biometric authentication is probably the most convenient option, but keep in mind that you should use it in conjunction with a hard to guess PIN or password to be as efficient as possible. Secure Folder can be set up using a Samsung account, according to the information provided by the company, and can be renamed or hidden from the home screen to make it harder to find in case someone has physical access to your device. The icon can also be changed. To get files into Secure Folder, you have two options. You can move data using the "Move to Secure Folder" option in the native apps or, from Secure Folder, by tapping the Add files button. So where does the Samsung Account come into play? Well, if you want to backup the data in Secure Folder, Samsung gives you the option to use its cloud service for it. The respective data is only available to the original user. 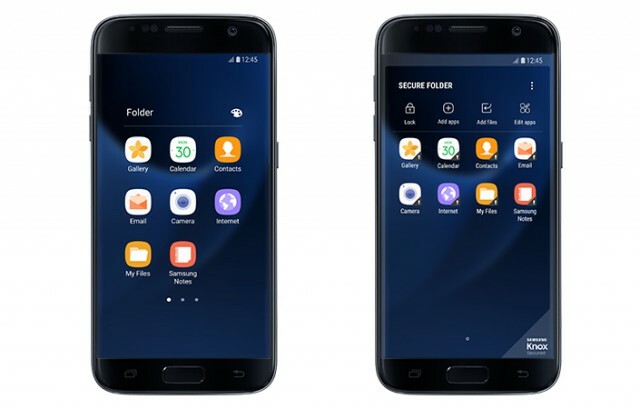 Secure Folder requires Android 7.0 Nougat and is currently offered only for the Galaxy S7 and Galaxy S7 edge, but Samsung says that it will make it available for other devices as well. The app can be downloaded from Galaxy Apps, Samsung's app store for Galaxy devices.